Stone restoration contractors often get calls to remediate accidental damage done by homeowners, cleaning services, janitorial services, and building service contractors who mishandle the care and maintenance of natural stone surfaces. 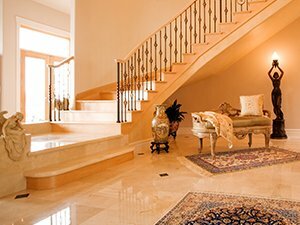 As an example, one of the most frequent mistake we see residential customers make is to use vinegar to clean a calcium-based stone like marble or travertine. Vinegar is an acidic substance that chemically reacts with the calcium in natural stone, transforming once-beautiful and elegant stone finishes into dull, rough-looking surfaces. Commercial customers have their fair share of missteps with stone care, too. For example, a commercial client sought professional services shortly after a maintenance employee (who did not have the knowledge, experience, or credentials to provide care or maintenance on engineered stone) applied a clear coating to three thousand square feet of flooring. The high traffic concentration at this facility caused dullness, damage, and wear patterns in walkways while the edges near the walls were still shiny. Every time the housekeeping department wet-mopped the floors, pieces of the brittle finish came loose. The calls we get usually start the same way, with the customer hoping that what was done to their stone didn’t ruin the finish and that they might be able to avoid having the stone replaced. Although we are always ready and willing to provide restoration services, we would like to offer some practical suggestions for avoiding natural stone damage during care and maintenance procedures. Dust mop floors daily to remove any excess grit that could scratch the surface. Use a neutral stone cleaner for mopping. For commercial clients who do auto scrubbing, use a very soft pad and keep the squeegee clean and free of soil. Do not use any penetrating petroleum distillate products that seem to darken and shine by clogging the pours of the stone with an oily finish. Not only is this difficult to remedy, but it can also increase the risk of slip and fall accidents. Do not allow acidic products to be used near marble or other calcium based natural stone. Although stone care professionals may use acidic polishing compounds, these chemicals can cause serious damage in the hands of those without the proper training and experience. Especially make note of toilet bowl cleaners. If they are used near natural stone, they should not be acidic. On showers and counter tops, do not allow any abrasive cleaners, even abrasive products considered “soft.” Many marbles can scratch and dull very easily when abrasives are used on them. Don’t use products for hard water removal unless they clearly state they are safe for natural stone as most of them contain some sort of acid. A stone impregnating sealer will repel spills, giving you enough time to clean up before they are absorbed by the porous stone and become stains. A professional stone restoration contractor can select the appropriate sealer for your stone and ensure it is properly applied. However, keep in mind that although impregnating sealers inhibit stains, they don’t protect the surface of the stone from etching. Although most granites are not susceptible to etch marks, something acidic like lemon juice, vinegar, or some cleaning chemicals can still create etch marks on marble or other calcium based stones, even if they are properly sealed. Following these suggestions will help you to avoid accidental damage. If you use a cleaning service, janitorial service, or employ building service contractors, be sure they are aware of these basic care and maintenance instructions for natural stone surfaces.